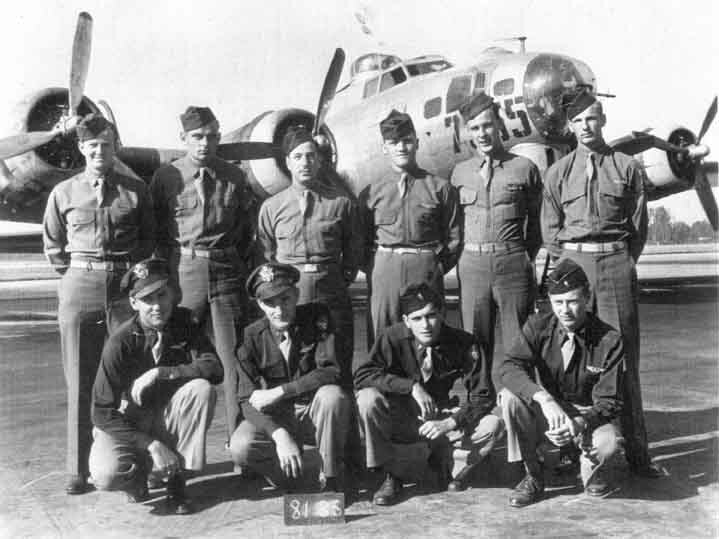 The 384th Bomb Group flew seventy missions in 1945, with the last mission flown April 25. From January 1 to April 25, 1945, twenty-two crewmen were declared missing from four different missions with their bodies never recovered. Of the twenty-two, twenty of the missing composed two crews who seemed to disappear from the face of the earth, never to be seen again. Harmon C. Hastings, tail gunner on his thirty-fourth mission with the John Joseph DeFrancesco crew aboard Fightin’ Hebe. The target was the railroad in Kyllburg, Germany. Prior to the Initial Point of the bomb run, the Fightin’ Hebe slowed up and dropped behind the formation due to flak damage to one or more engines. It was then lost to view in contrails and later crashed near Baasem, Germany. The rest of the crew of nine parachuted to safety and became POWs, many of them close to the end of their thirty-five missions and completion of their tours. Hastings is said to have acknowledged the order to bail out and was seen leaving the plane. One of the crew’s theory was that Hastings fell into the hands of civilians or SS troops or failed to make good his escape. The pilot, John DeFrancesco, related to me that he parachuted down unseen in the middle of a heavy snowstorm and evaded capture for a few days. Spying an empty jeep, he climbed in and attempted to drive away in it, but was captured before he could do so. Harmon C. Hastings is listed on the Tablets of the Missing at Henri-Chapelle American Cemetery, Henri-Chapelle, Belgium. All are listed on the Tablets of the Missing at Cambridge American Cemetery, Cambridge, England. About a minute and a half before bombs away, the number three and four engines were hit by flak. With pressure dropping, they were forced to feather #3. There were also flak holes throughout the right wing, the left Tokyo tank hit and drained, plexiglass in the nose broken, and several holes in the nose section of the aircraft. No men were wounded by enemy action. They had enough power to stick with the formation on into the target and dropped their bombs with the formation. Following the group off the target, the damage caused them to drop behind. The co-pilot suggested going to Russia, but the pilot wanted to try to make it back to England. They began losing altitude and air speed and lost the group, but followed the bomber stream back to the coast. They crossed the coast at about 17,000 feet, where they received more flak, but no further damage was inflicted on the aircraft. Losing altitude more rapidly, they jettisoned everything possible, and were even working on removing the ball turret, but were unable to get it completely off. At 5,000 feet the crew prepared for ditching in the North Sea and threw out the rest of the equipment that they could. A B-17 flying alongside them likely radioed their position. The radio operator, Maki, sent out S.O.S.’s until about 500 feet, and everyone except for the pilot and co-pilot assumed ditching position in the radio room. They hit the water at 1315 hours. The ship bent slightly in the middle. In the ditching, the togglier injured a leg and broke a few ribs. The navigator sprained an ankle and the tail gunner was bruised up. (See note below). As soon as they hit the water, they got out, but the life raft handles wouldn’t come out. They got out on the wing and pulled the extra handle and the rafts came out. Only one of the life rafts would inflate properly. The other only half inflated. Some of the Mae Wests (life jackets) would only partially inflate also. 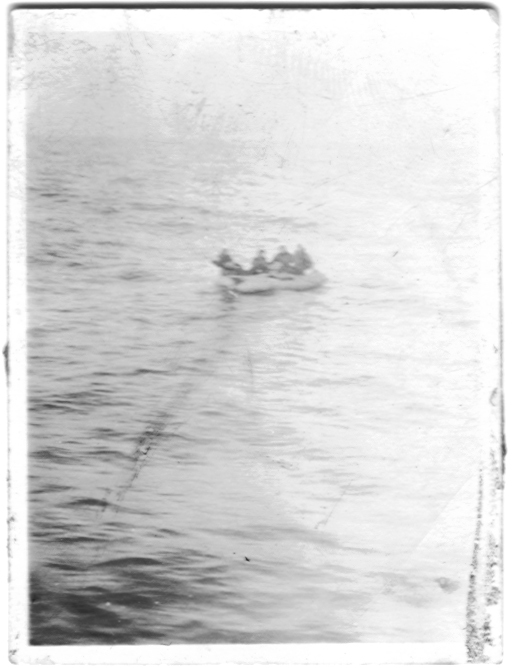 A big wave came along and carried off both rafts, so the men were forced to swim for them. [The average water temperature of the North Sea in February is about forty degrees Fahrenheit.] The pilot swam thirty-five to forty yards to reach the farthest raft, which was only partially inflated. 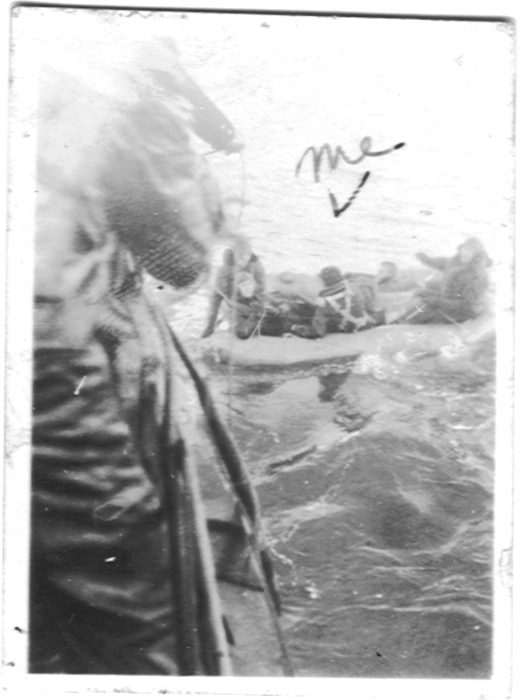 The rest of the crew swam for the other, closer raft and the ball turret gunner – Jack Coleman Cook – who reached the raft first, helped everyone else in. However, Frederick Arnold Maki, the radio operator, never did make it to the raft. The crew saw him and tried to row over to him, but the waves were too high and they lost track of him as he drifted back towards the ship. Five men were in the raft with two in the water hanging onto the sides. They rowed toward the pilot in the other raft. The pilot had lain down as soon as he had gotten into the raft and they hadn’t seen him move since. While the men rowed toward the other raft, the navigator, who had been in the water and holding onto the side for thirty minutes, got the cramps. Cook got out of the boat and got the navigator back up to the raft and they pulled him in. Cook stayed in the water and helped push the raft along by kicking his feet in the water. He was in the water about forty-five minutes before they reached the other raft. 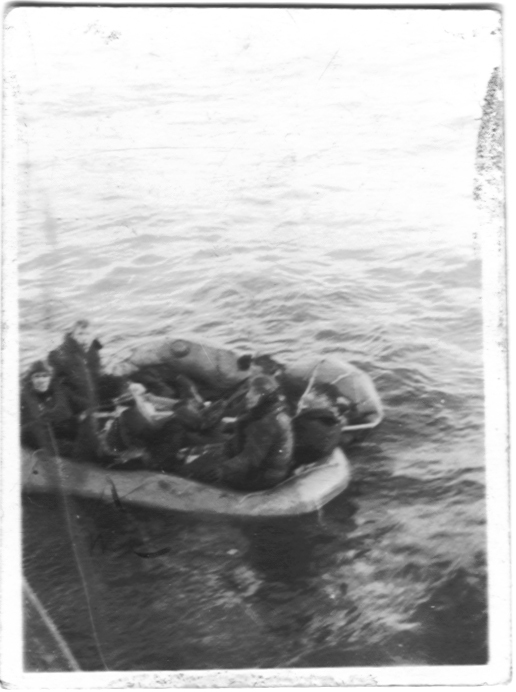 Cook and Duncan got into the raft with the pilot when they reached him. The men bailed water out of both rafts, but the other raft seemed to fill up faster than they could bail it out. They were also unsuccessful in pumping up the other raft. A B-17, three PBY amphibious aircraft, and later some P-51’s witnessed the efforts of the men in the rafts. Long, the pilot, began to froth at the mouth and talk out of his head. The men doubled their efforts to bail the water out of the raft, but weren’t very successful. At about 1715 hours, the men spotted two P-47’s and fired a flare. They dropped smoke flares and flew east to pick up an Air/Sea Rescue Cutter, which was about four miles from the men in the rafts. By the time Air/Sea Rescue arrived, Cook was talking out of his head and the pilot was perfectly still. Air/Sea Rescue took the men aboard and worked on the pilot until they docked, about four hours later. Vrana said, “There was no life in him at all. There was still a faint bit of life in Sgt. Cook and they gave him oxygen and artificial respiration, but he died on the boat.” The men were delivered into Milton Lodge. The pilot, Robert C. Long, died in the raft. The ball turret gunner, Jack C. Cook, died after rescue. The radio operator, Fred A. Maki, never reached the life raft and was washed away. Robert C. Long received a posthumous Silver Star for gallantry in action. Frederick Arnold Maki is listed on the Tablets of the Missing at Cambridge American Cemetery, Cambridge, England. The togglier, Marvin Irving Rudolph, who reportedly injured a leg and broke a few ribs, was able to return to duty after about six weeks. The navigator, Edward Field, who sprained an ankle (and who also provided the photos below), was able to return to duty after about six weeks. The tail gunner, Thomas Arnold Davis, who was bruised up, was able to return to duty after about four weeks. The remaining crew, who had no reported injuries – Ralph John Vranna, co-pilot; Howard Jasper Ogelsby, engineer/top turret gunner; and Donald Ramsey Duncan, flexible gunner – all returned to duty after four to six weeks. Photo courtesy of Edward Field, 2011. Crew being picked up by British Air-Sea Rescue – Crew being picked up by British Air-Sea Rescue. 3 February 1945 mission to Berlin. Choppy waters. I (Edward Field) forgot to take off my parachute harness before ditching. Photos of rescue by photographer aboard British Air-Sea Rescue boat – Photos of rescue by photographer aboard British Air-Sea Rescue boat. Robert Long (Pilot) and Fred Maki (RO) survived the ditching, but Maki was swept away and lost, and Long succumbed to to exposure. Ostend, Belgium is on the coast, which leads to the assumption that the ship went down in the English Channel or the North Sea and whatever remains of the aircraft and her crew are still down there today. By thearrowheadclub in 384th Bomb Group on April 20, 2016 .